* NEW: Planned Release Wizard. This utility will calculate and create a number of releases, such as creating a release on the first Monday of every month. It can create planned releases using a fixed quantity until the Control Quantity is met, or, it can divide the Control Quantity evenly over releases in a specified time frame. * NEW: Auto-Firm Releases Utility. 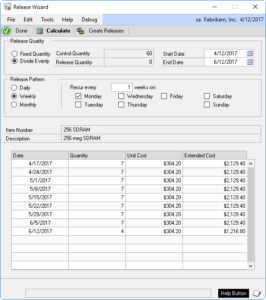 This utility will automatically create Firmed Releases when the Required Date meets selection criteria. Releases can be created before the Required Date by using the Vendor Lead Time and/or Purchasing Lead Time. The new Release Wizard window is shown below. The Release Wizard is accessed from the PO Release Entry window. In the example above, it calculated Planned Releases for each Monday between 4/12/2017 and 6/12/2017. 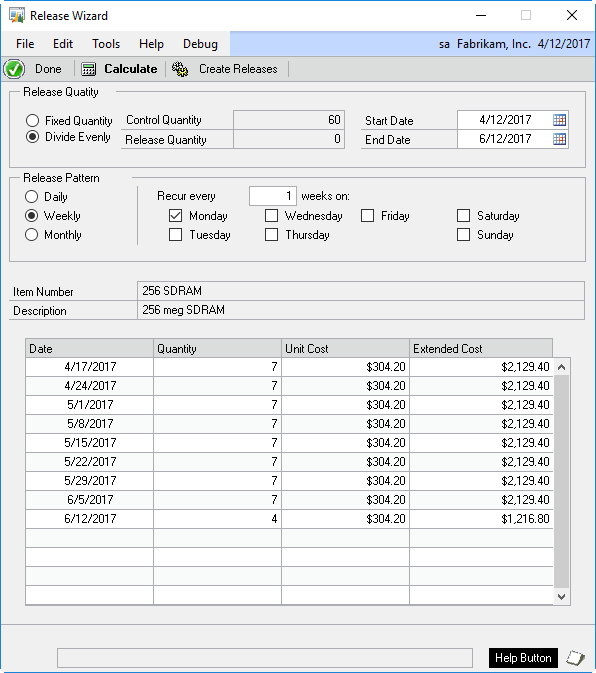 When the desired scheduled is achieved, the Release Wizard can create a Planned Release for each Date/Quantity, adding them to the PO Release Entry window.